Globally, roughly 300 million tons of plastic are produced per year; 8 to 12 million tons of these end up in our oceans and have severe consequences for marine life. 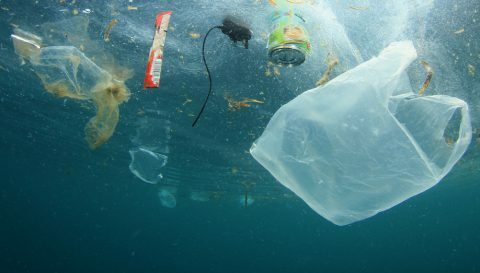 Around 80% of plastic waste in the ocean originate on land, much of it is packaging – styrofoam, plastic bottles and plastic bags (Source: Greenpeace). The remaining 20% come from ocean-based sources, such as fisheries and cargo ships. According to a study by The Guardian, a million plastic bottles are bought around the world every minute. Fewer than half of the bottles bought in 2016 were collected for recycling. Additionally, only in the EU, approximately 100 billion plastic bags are consumed every year and a total of 163kg of packaging waste is generated per inhabitant (Source: European Commission, Eurostat). Due to its durability of hundreds of years, plastic is becoming an increasing problem worldwide. Consumers in Europe are evermore eco-aware, they care about how and where their products and their packaging are produced and are looking for sustainable brands and stores. Retailers and packaging firms are trying to reduce their environmental impact through new, innovative products and materials. In 2015, a new legislation obliged the EU Member States to reduce the use of lightweight plastic carrier bags drastically: by almost 50% by the end of 2019 (not more than 90 bags/person/year) and by 80% by the end of 2025 (not more than 40 bags/person/year) compared to 2010. Before this EU Plastic Bags Directive, up to 200 bags per person were consumed every year. As an upcoming trend in retail worldwide, biodegradable or compostable bags or packaging material are now widely offered by retailers and brands. These are mostly made from starch blends (corn, potatoes, etc. ), biodegradable polyesters or cellulose. German Rewe Group has removed plastic bags completely and is only offering cotton, paper and jute bags, as well as bags made from PET bottles, in their stores. Tesco UK will stop the sale of 5p plastic carrier bags across the UK by end of August 2017 and will offer more expensive “bags for life”, made from 94% recycled plastic. Unilever committed to ensuring that all of its plastic packaging is fully reusable, recyclable or compostable by 2025. The campaign “A Plastic-Free Aisle” by A Plastic Planet urges UK supermarkets to create a plastic-free aisle in every store. In Kenya, producing, selling or using plastic bags has been recently banned and made illegal. In the United States, in some cities and even entire states (such as California or Hawaii), single use disposable plastic bags are banned in large retail outlets. These are just a few examples of retailers and brands working towards a circular economy. As there is now a wide range of “green” packaging choices, it can be difficult for a shopper to distinguish between bio-based, fossil-based, non-biodegradable, biodegradable, compostable or recyclable products and how to dispose of the various materials. Clear product labelling is therefore crucial to get a clear message to the customer! Although the real ecological footprint of some materials is debatable, they can potentially offer a sustainable alternative to plastic and help a retailer to show responsibility and to act in the interests of the environment and society. In addition, sustainability concerns influence the customers’ buying choices. Therefore, supermarkets are incorporating sustainability into their core business strategies, in order to meet the demands of their customers and also to present themselves as a sustainable business, which has a positive effect on the company’s image. For a “health check” of your company’s strategy in regards to green packaging and sustainability, contact us here!